Pitching prospects of the Chicago Cubs are starting to catch the attention of MLB scouts. After a strong 2016, there is hope for Trevor Clifton to reach his potential. The MLB Amateur draft is a tricky event. Teams select players they believe are the best for them at that moment. More times than not, it does not lead to big league players, at least not regular starters. Many players may get a call up to the Majors and play a game or two, but that may be all. This is especially true for late round players. Get into the twelfth round and selecting a straight-out-of-high-school pitcher is a risk. They are young, their bodies are still developing, and their mentality may not be as tough as is needed. And then, they starting playing in Single-A, posting an ERA over 6.00. Struggles abound. Frustration sets in, and they fizzle out. 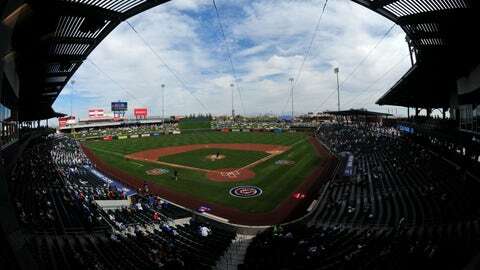 2/2 – Chicago Cubs: What should we expect from Cactus League play? Thus starts the story of Chicago Cubs prospect Trevor Clifton. However, it is far from over. Drafted in the twelfth round out of Heritage High School (Maryville, TN), Clifton has shown improvement over the years. Now, he is the number eight prospect in the Cubs’ system. It must be difficult. At 18 years old, you graduate high school, get drafted by the Chicago Cubs in June, and move to Arizona for rookie ball. So much change in such a quick amount of time is not easy, but that is what Clifton had to do in 2013. And he struggled out of the gate. In eight games during the Arizona Rookie League, Clifton posted an ERA of 6.97 in 10.1 innings, allowing eight runs. He managed to strike out 15 and walk eight in those appearances. In 2014, Clifton was the Cubs No. 23 prospect in the system and showed progress in short season league play. He followed this with a solid season with Single-A South Bend in 2015. Clifton finished that season with a record of 8-10 in 23 starts and 108.2 innings pitched. Fewer batters were walked and more struck out. He moved up to No. 18 in the system. Clifton made the move to High-A baseball with the Myrtle Beach Pelicans in 2016 and it was a season to remember. Not only did he achieve a record of 7-7with a 2.72 ERA in 119 innings and a 3.16 K/BB ratio, Clifton was named Carolina League Pitcher of the Year. He was also the Chicago Cubs Minor League Pitcher of the Year. When Clifton was drafted in 2013, he possessed a mid-90’s fastball and a scrawny 180 pounds on a 6′ 4″ frame. Since then, he has filled out and strengthened his arm. From a mechanical standpoint, his delivery is a bit like Jake Arrieta, throwing across is body slightly. This caused some control issues, but Clifton is showing improvement. Additionally, he is obtaining a higher spin rate on a curveball that breaks hard. Overall, Trevor Clifton‘s ability show promise as a middle or back end of the rotation pitcher. His fastball ranks 60/80, and his curve is 55. Addition work on a change-up is still needed to keep left-handed batters off balance. The fact that he pitched two straight seasons with 100+ innings shows durability. His command needs work, but the Chicago Cubs’ system is one that produces solid pitchers. He is in the right spot. The major concern with Clifton is the logjam of pitchers ahead of him. Currently, there are 37 pitchers attending Spring Training in Arizona. Names include Pierce Johnson, Duane Underwood, Felix Pena, and Caleb Smith. But, Clifton is not on the team’s list this year. The door is open for him to make his homecoming and start for Double-A Tennessee, about 41 minutes from Clifton’s hometown. Should his progress continue, Clifton could make it to Triple-A Iowa in the middle of the season. Does he become trade bait or make the club in 2018 is unknown; however, what we know is Trevor Clifton has a bright future.